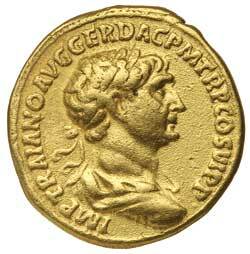 TRAJAN, (A.D. 98-117), gold aureus, issued 116, Rome mint, (7.11 g), obv. 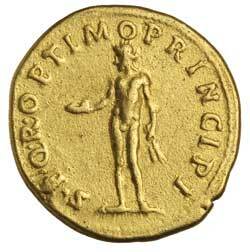 laureate head of Trajan to right, draped and cuirassed, around IMP TRAIANO AVG GER DAC P M TR P COS VI P P, rev. naked Genius or Bonus Eventus standing to left, holding patera and corn ears, around S P Q R OPTIMO PRINCIPI, (S.3104, RIC 278, C.399). Cleaned, slightly porous field, very fine and rare. Ex Dr V.J.A. Flynn Collection and previously from Noble Numismatics Sale 109 (lot 3511) and Sale 89 (lot 3757).